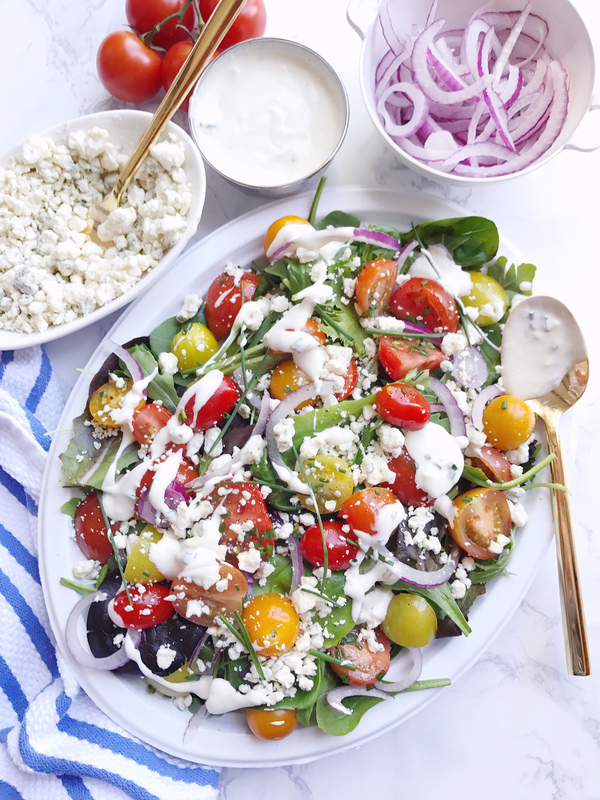 Tomato and Blue Cheese Summer Salad. I’m so excited that Memorial Day is coming up soon, because it means that summer activities like beach days and picnics and barbeques aren’t far behind. Those summer cookouts are at the top of my to-do list when the warm weather arrives, because there’s nothing better than a casual backyard gathering with all the tasty BBQ classics. I’m pretty traditional when it comes to a cookout menu and love burgers and hot dogs, pasta salad and potato salad, and maybe if I’m feeling wild I’ll make something fun like baked beans or deviled eggs. 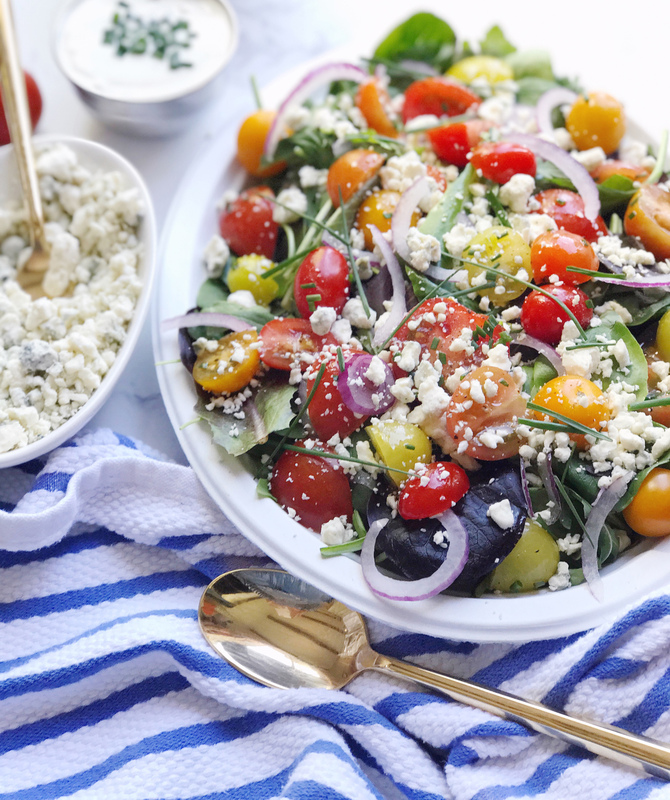 Somewhere in that mix, I always feel like I should offer a green option too and fall back on a simple garden salad as my veggie dish of choice. 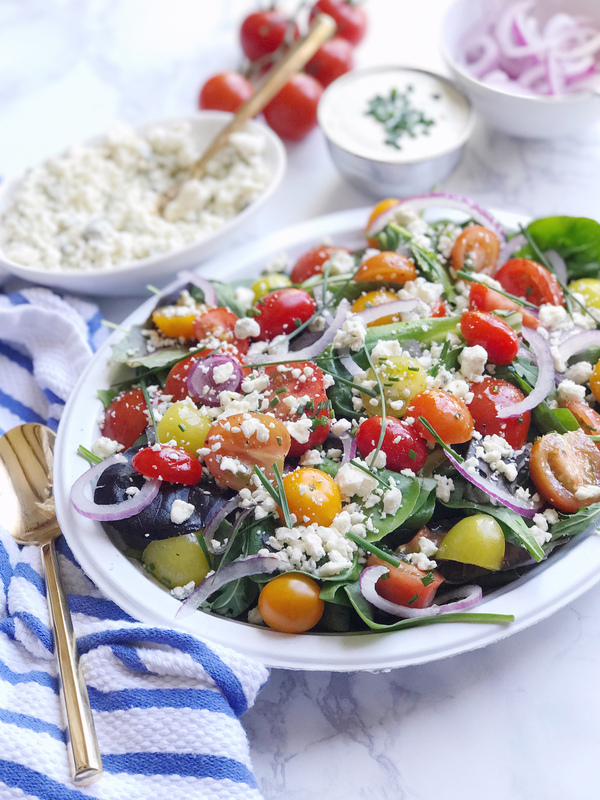 As we gear up for the holiday weekend, I thought it would be the perfect time to revisit my summer cookout salad and give it a bit of a lift. One of the first signs of summer in the grocery store is when the tomatoes start to shine front and center. 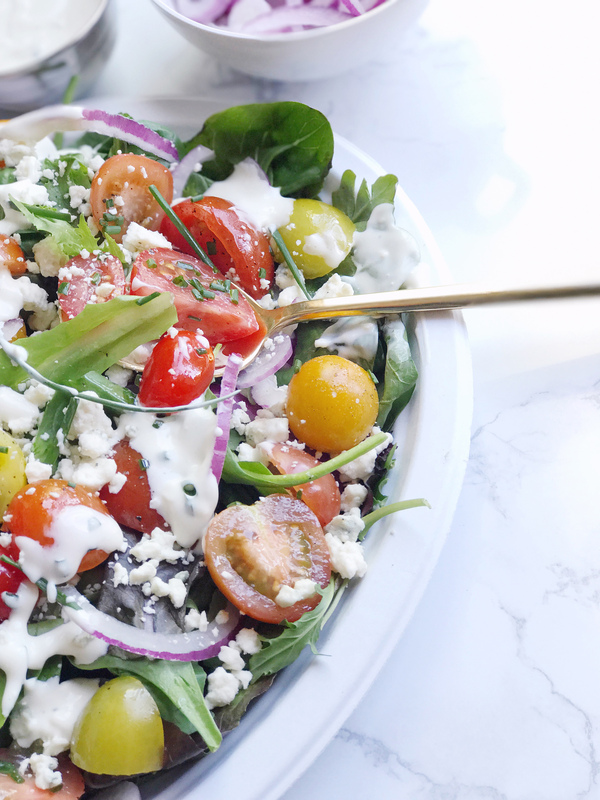 I thought I’d make use of a variety of sweet ripe tomatoes for this salad, and borrow a few flavors from my favorite wedge salad recipes too. 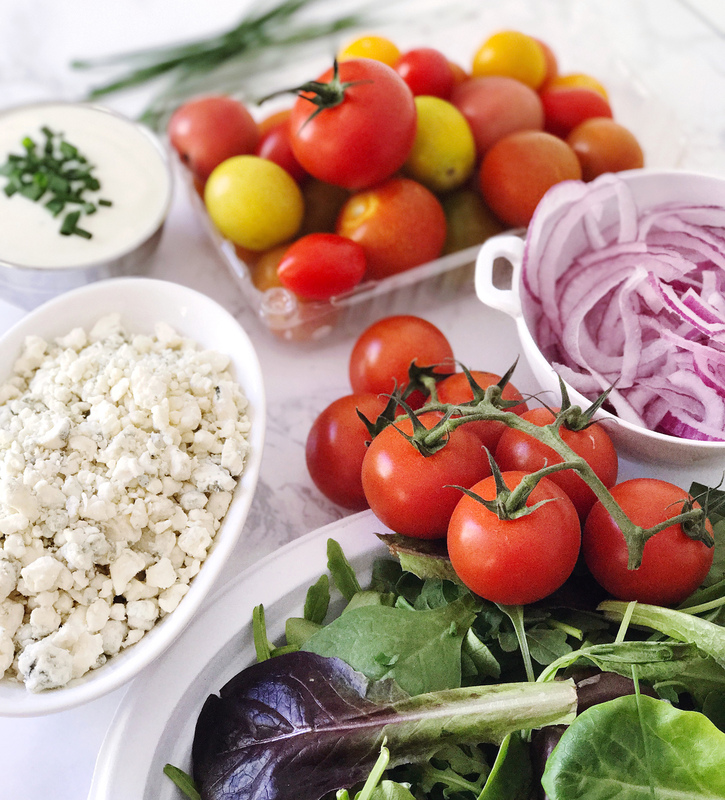 Crisp sliced ribbons of red onion and the rich crumbled blue cheese make a delicious combination. I mixed up these simple ingredients with fresh chives, salt and pepper, and arranged them on a bed of greens: arugula, spinach, and mixed baby lettuces. I assembled the whole dish on one of my cookout secret weapons: Chinet® Classic White™ platters. In my opinion, barbeques should be kept simple, casual, and easy. I lean on paper plates and napkins for these occasions, and these platters make for an even easier time cleaning things up so I can get back to the party. We’re big on recycling and are even starting to compost this summer, and these Classic White products are biodegradable when composted, how cool is that? 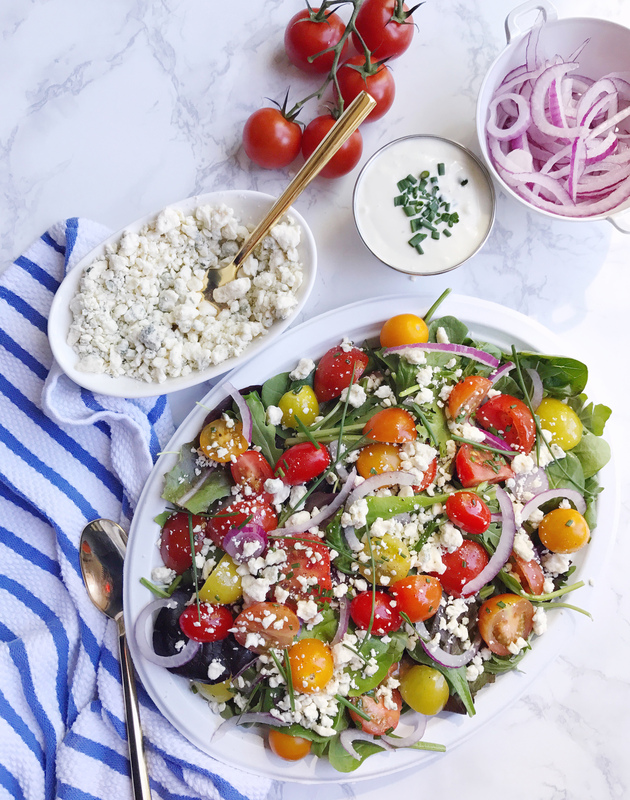 Get the full recipe for this simple tomato and blue cheese summer salad below, and let me know in the comments what’s on your Memorial Day weekend BBQ menus! 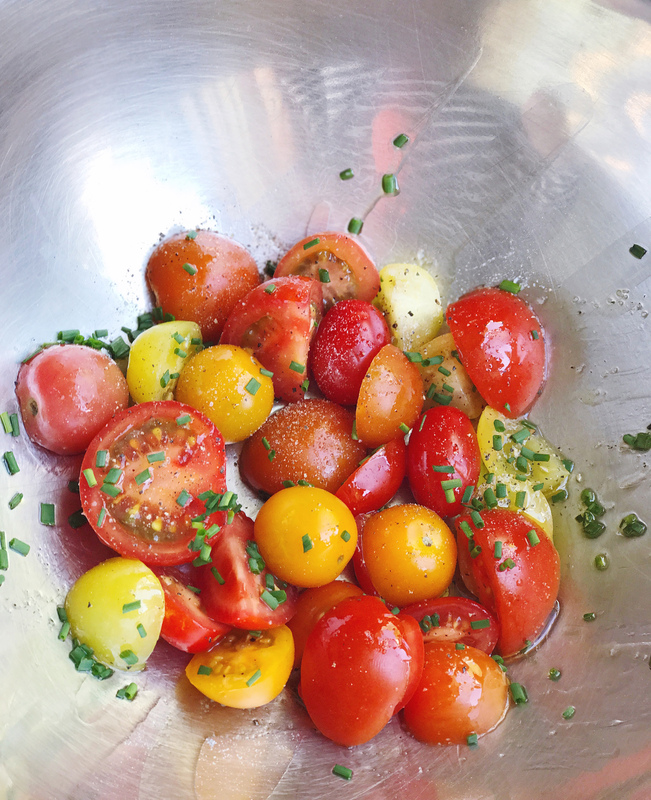 Slice tomatoes into halves or quarters depending on their size and toss with a drizzle of olive oil, chopped chives, and season with salt and pepper. Let the tomatoes rest for 15 minutes and drain any excess liquid. 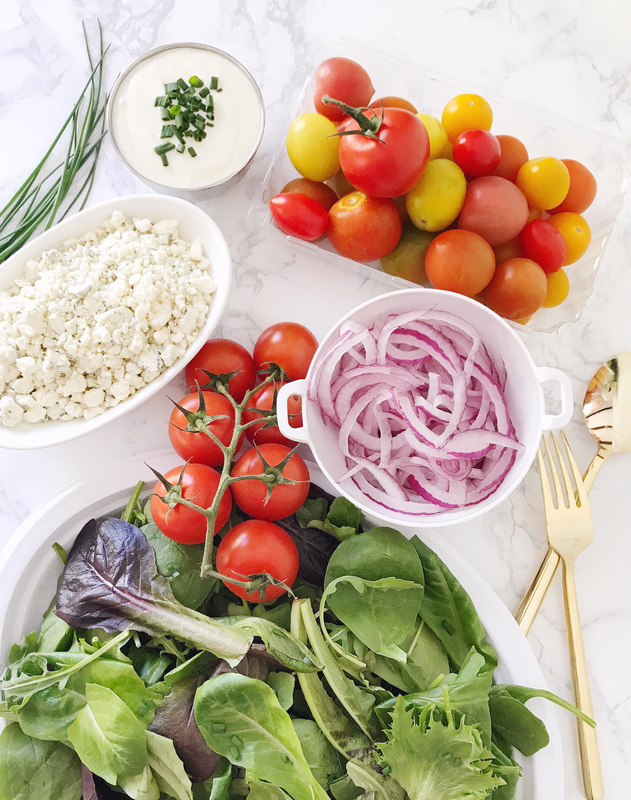 On a platter, layer the mixed greens, thinly sliced red onions, and tomato mixture. Top with crumbled blue cheese chopped fresh chives, and serve with blue cheese dressing on the side. Please note: This post was created in partnership with tthe Chinet® brand. All opinions, images, and content are my own. Thank you for supporting brands that help support this site! Buffalo-BBQ Turkey Burgers Prepping for Summer Guests. One Response to "Tomato and Blue Cheese Summer Salad."